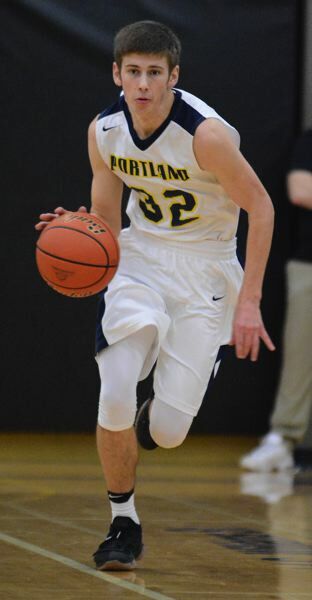 Portland Community College point guard Brendan Ritschard is best know for his passing — his uncanny ability to whip the ball into tight spaces and watch his teammates put the ball through the hoop. So it was a bit of a twist when he fired a pass into the corner only to have his teammate send it right back. But Ritschard knew exactly what he had to do. "I had a lot of space, so I took the shot," Ritschard said. "I was hit on my follow through, but I had already released the shot and knocked it down." He also hit his free throw to complete the rare four-point play. "He's usually so calm and collected, but on that play he showed so much emotion that our entire bench jumped up," Portland coach Tony Broadous said. "He rose to the occasion in a big moment and it ignited our team." The clutch shot gave the Panthers some breathing room in a key late-season game at Clackamas. The final margin of victory — four points. Two weeks later, Portland would come to Mt. Hood and walk out with an 83-76 overtime win to clinch first place in the South Region. It marked the first time in Ritschard's athletic career that he had finished on top of the heap. He and his Panthers' teammates look to add another championship memory to their scrapbook when they start the Northwest junior college playoffs against Bellevue at 6 p.m. Saturday in Everett, Wash.
Portland (24-5) won its first nine games and has been among the top 3 in the Northwest rankings all season. "From the time the first rankings came out, our coaches have been preaching to us that we're going to get the other team's best effort," Ritschard said. "We've had the willingness to come together and chase one goal — that's been the key to our success." Look for the full profile ahead in our Friday, March 9, print edition.